Could this be one of the most unique looking aluminum bumper cases for the iPhone 4? The Cleave bumper by a Japanese company called Deff looks like something designed off of a luxury sports car. It looks like Deff thought out just about everything and fitted the Cleave with dedicated volume buttons and even a silent switch extender and there are only two screws used to put everything together. There are even large cutouts for the dock connector and headphone ports to accompany most 3rd party accessories. Most importantly, Deff claims that the Cleave aluminum bumper does not interfere with the iPhone 4's signal because no contact is made with between the iPhone 4's antenna band and the Cleave bumper. 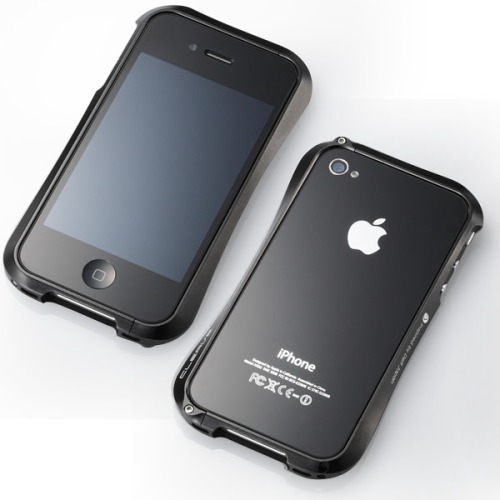 The Cleave is fitted with polyurethane sheets at all four corners to help protect your iPhone 4 against shock. It seems as though this could be the perfect aluminum bumper for the iPhone 4 but all of this comes at a price, about $110 to be exact. It isn't the priciest aluminum bumper out there like Element's Vapor bumpers. If you're not from Japan, chances are you will have a hard time getting your hands on this one.